User Generated Content (UGC) is a key growth area online, and social networks now attract 1 in 5 Internet page views in the UK. In this presentation, Robin will describe the digital content landscape in the UK, discuss the popularity of UGC (User Generated Content) brands (e.g Facebook, Twitter, Wikipedia) - and compare some of their content strategies to those of top online publishing brands. Patrick Altoft, managing partner at Branded3, a Leeds-based full service digital agency. Patrick will take a practical look at the role search engine optimisation plays in social media marketing. Nick Turner, head of digital content for the CN Group, on Opening the doors to the community. How newspapers in Cumbria have been providing training to community groups and giving them access to create content on their websites. Groups ranging from the police to the Brownies have taken up the opportunity and now add news, information and pictures. Nick will report on the pros and cons of the experiment. The meeting, which starts with a networking lunch at 1pm, leads into a networking reception at 5pm and the the 12th Journalism Leaders Forum at 6pm. 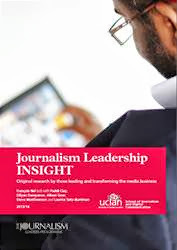 These events form part of the programme of the Spring seminar of the Journalism Leaders Programme at the University of Central Lancashire, who sponsor the event. To sign up to attend or for more information, contact the convenors Nick Turner or François Nel.